First of all, welcome at this forum!! Why did you conclude that Michael Jackson + Benazir Bhutto have short life lines...??? So from my point of view, this implicates that their rather early death can not be 'explained' by the length of their life line. "Any body can give the comments and prove that the length of life line is not tied the length of life after seeing these 2 pictures......."
I hope I have answered all your questions!? hello martijin you dont think so that the life line of michel jackson reveal the length of life.............. even v can see that the life line of him at 50 have broken witch shows about his death........? but the michel life line is short may be i cant see clearer if i am wrong so where i am wrong..........? if we take a look at benazir pic again we can see the broken or crash life line(see point number "8") at the age of 54 witch shows death of her.............? have you ever seen any any old man with the short life line in both hands..........? Sorry, I think it is appropriate to repeat my earlier comment again: I observe that the life line of Michael Jackson and Benazir Bhutto is 'long' (or at least within the range of 'normal'). 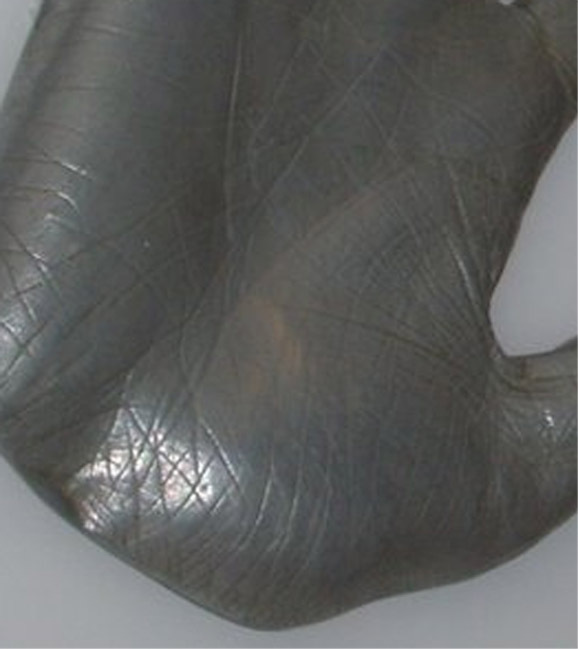 For example, the picture below is a zoom-in on another photo of Michael Jackson's hand cast of his right hand, which quite clearly demonstrates that his life line is actually... 'long'! ... So, I think you are wrong by describing his life line as 'short'; and yes indeed: I think there is NO connection between the length of Michael Jackson's life line and his age of death. 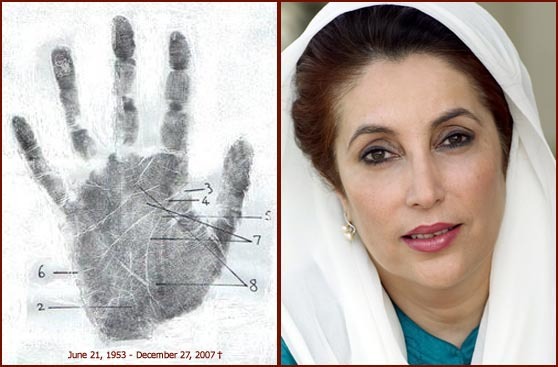 and what about the "8" point (whare her life line shows broken life line at the age of 54) of benazir bhoto life line and heart line......? can you clear this point.........? and still you didnot give me the answer tht i asked you is have you ever seen old man with the short life line in both hands.....? i dont know why all the modern palmist of this forum cannot comments about my questions.......? parkash wrote: hello martijin you dont think so that the life line of michel jackson reveal the length of life.............. even v can see that the life line of him at 50 have broken witch shows about his death........? Thank you for you new efforts to discussed the details. Yes, I think there is no correlation between Michael Jackson's age of death... and the length of his life line (it is actually quite long, certainly not below average), nor any other characteristics of his life line. For, I think that the last photo shows that there is no real 'break' at all. Regarding Benazir Bhutto's life line... also in this example the length is perfectly normal. And regarding the line which transverses the life line, I am aware of the (fatalistic) theories about that characteristic - but I think this theory has an element of a 'self-full filling prophecy'... simply because WHEN such a line transverses the life line, it will always be in the lower part of the life line. So, I think one really needs to consider the exact details in those cases - for example by providing a detailed analysis of what exactly is going on in a hand. But from one case one can not draw any conclusions about the theory. PS. In the recent past I have been confronted with other people who had the same wondering about that characteristic, but I think if one starts dealing with the details... then one will likely conclude that there is no link between that characteristic and Benazir's age of death, etc. Yes, I have seen those examples. For example, I have an aunt who really has very short life lines in both hands (much, much shorter than M.J. & B.B.)... but she has passed the age of 67. Parkash, I hope I have now answered all your questions!? Anyway, greetings from The Netherlands!! Dear Parkash... on top of my 'aunt' example, I can add that in my article that was introduced earlier in this discussion by Lynn - the 2 studies mentioned in the article present data which suggests that some of the people who definitely belonged to the category 'short life line'... died at an age of 75 or even higher. So, from my point of view the data of both studies illustrates that my aunt is very likely not a very unusual case at all - probably because (despite the significant correlation described by the first study) there is no direct link between length of life line & age of death. ok the graphically pretension witch you shown me is actually have only left hand life line data or length of life line include both hands,,,,,? and can u tell me about the subject of red dot exactlly witch part (age) have broken in them life line ? parkash wrote: and still you didnot give me the answer tht i asked you is have you ever seen old man with the short life line in both hands.....? I haven't seen enough hands of elderly people to comment. only anecdotal 'evidence' - my friend's aunt's lifeline was around 1/3rd of potential full length. she lived to 93 or 96.
i appreciate your comments and you also but have you ever seen in your eyes or any old person who have come and show you the hands of him and you seen short life line in his both hands...........? hi Parkash, I think I already answered your question? Martijn & I each gave you an example - his aunt & my friend's aunt. I don't have her hand prints so I can't prove it to you. parkash wrote: ok the graphically pretension witch you shown me is actually have only left hand life line data or length of life line include both hands,,,,,? Yes, you're right... the picture that I presented only includes the data from the left hand (the researchers of the 1974 study presented only a visual impression for the left hand - but the results were not better for the right hand). No, I have no additional info available about the subjects with a 'broken life line' (notice: they do not only concern the red dots, also the half of the subjects with the yellow dots!). PS. I completely understand Lynn's response: it's a bit strange to notice that after Lynn and I mentioned that we both have seen a short life line in an old female (actually, I do have both handprints of my aunt)... you simply repeated your question, or do you really want us to mention an example for an old MALE as well??? Anway - parkash, I do appreciate your efforts to discuss the details about this 'classic' topic! just supose i ill tell you that i have seen my grand father or grand mother hands and i have told him/her that he ill die at the age of x and month of x .....and he/she die exect as i predict him/her..... so are you beleive in my story...? obviously not....? i think you got my point? Thanks Parkash, I understand what you are saying. I would believe your story. To be correct about the exact month is amazing! How did you do that, was it something on the hand or some intution about the month? I don't think we said "It's not possible", rather - it's not accurate for everyone, in every hand. Predicting someone's death is of course a major responsibility!! We could terrify the person. How can we be sure we are accurate? If we are wrong, then we have caused unecessary fear. If we are correct, would someone really benefit from knowing this information? Then there's always the question of 'self-fulfiling prophecy', even the possibility of 'coincidence'. Also we need to know not just the times when a prediction worked, but also when it didn't - things have to work over and over again before we can be sure of our interpretations & be confident that it is accurate. Personally, I would never predict age of death. (tho when I first learnt palmistry, I confess I used to say things like - 'you have a long lifeline which means a long life' , but over the years have changed my ways of reading.). There is a parallel discussion about the same topic on Patti's forum. Patti tells a very interesting example there. 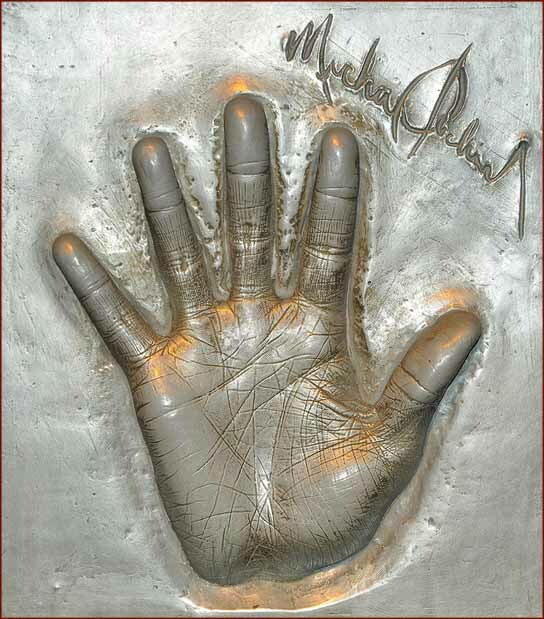 The handprint below belongs to a Dutch woman at age 67 (notice this handprint was taken when she was much younger: at age 53). Do you see what see? I see: that she has an extremely short life line.. it doesn't even enter the mouse of the thumb (a.k.a. mount of Venus). I think this 'case' on it's own PROOFS that there is no direct link between the length of the life line & the age of death!! PS. Trust me, I can add that the life line in her left hand is slightly longer - but still very short as well. And I can also add... that this woman has not had any easy life at all - but based on what I recently heard about her, I expect that she will be able to reach a much older age than she managed so far. I am sorry Parkash, but there is so much evidence 'against' the notorious theory about the length of the life line... that your report about your experience with your grand father can simply be described as just 'coincidence'. Okay, if the truth is exactly what you told us - it is definitely a rather impressive story... maybe have a 'psychic' gift (as was also sort of suggested by Lynn), but your story is just a story on it's own. Your story has only anecdotal value (simply because it's just a story, no details about your grandfather's hand, nor any direct proof that your observation was correct, etc. etc.). ... that YOU requested us to present 'PROOF' - but I would like to notice here that from your side, you haven't yourself presented us any proof for your story at all!! So, now... ... are you finished with this discussion? I think it's time to SHOW US that your words are 'true'... ... and I am wondering: when exactly can we expect you to 'rub your name' and become a 'modern palmist'!??? 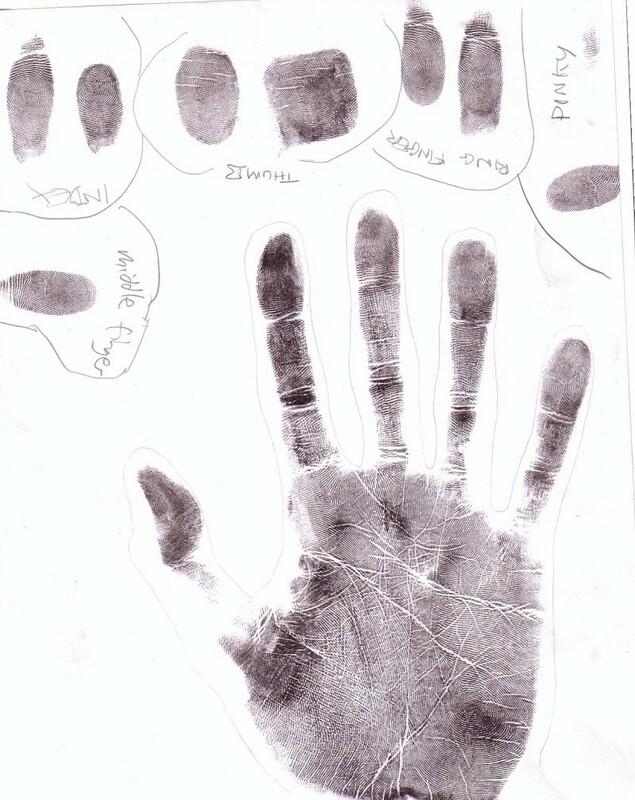 Martijn, thanks for posting your aunts handprint. Indeed it is very similar to how I recall my friend's aunt's hand (who died in her 90's). However I could now find myself arguing - is the red line her lifeline or is it an extended line of mars? Is the green line her fate line or could it be her long lifeline (attached to headline for a long time eg. if she was attached to family for a long time / slow to 'cut the apron strings' / late developer in some way?)? I understand your association regarding the green 'fate line' - but I think one can safely reject the idea that it is a 'life line' for various reasons: but my major argument is be that this 'fate line' clearly points in the direction of the zone between the index finger and the middle finger... obviously that is a typical characteristic for a 'fate line' - and not a typical characteristic for a life line at all! PS. 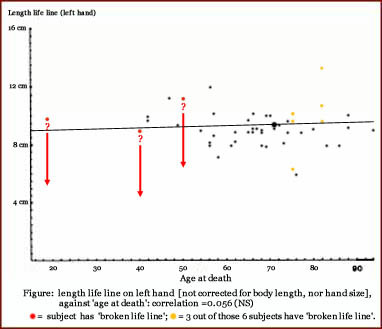 I can report that the left hand shows a 'fate line' with exactly the same characteristic (same postion + directed to the same zone), but without any doubt... in the left hand this characteristic does not induce associations with the life line at all, also because the life line is there much stronger. PPS. And the hands of one of her children shows the same characteristic. Actually, before I posted the print I was very aware that one might make the wrong associations... therefore I decided to color the lines before presenting the picture. ... so, with confidence I reject your doubts that the red line might not be a 'life line', etc. Thanks for mentioning. what do you think martijin........? i think i am not wrong .....? male, right handed, age 23 or 24 when print was taken. - the 'first component' starts at the wrist and is slightly directed to the pinky finger: which is a completely normal position for a 'fate line' - I am 100% sure.... that aspect doesn't belong to the life line! - the 'second component' starts a few cm's higher - halfway the 'first component': this second aspect is slichtly directed to the ring finger - I am 100% sure... that aspect doesn't belong to the life line either! - and the 'third component' starts almost at the end of the 'second component': this third is directed towards the zone between the index finger + middle finger and ends at the HEAD LINE (it has all typical characteristcs of a 'dissociated head line', which is not connected with the life line - including a 'smooth' straight path). 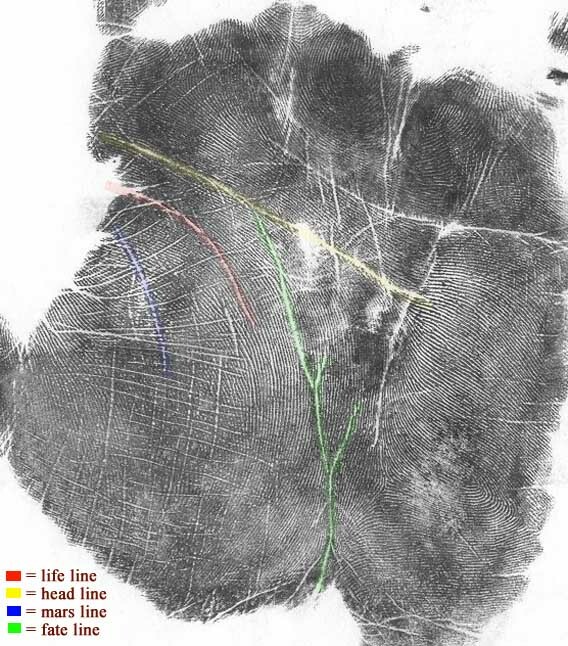 I think one could describe it as a 'splitting' from the head line (the yellow line) ... but I can not describe ONE SINGLE characteristic that indicates that this line can be described as a 'life line'. Parkash, you've only described that in your perception the red line is a 'life line'... but you've not given one single argument!! And finally, I also reject you observation that the red line is a 'mars line' ... because that line starts in the lower zone of the mount of Jupiter - and Mars lines do not start in the mount of jupiter - actually, the red line has ALL basic characteristics of a typical life line (structure + position + the typical curve)... the only unusual characteristic is that it is a very short!! Parkash, if you hold on to your opinion about my 'short life line example' + the 'notorious life line theory'... I think you actually hold on to an illusion! Anyway, thank you for your efforts so far! I think the same as Martijin, except the branch off the fate line is an effort line, the fate line continues with overlapping breaks and finally settles with a straight line. I forget to say the effort line stops at the head line. aahmm lynn can you tell me that the hand print you posted ,,, how old he lived....?